Branches loaded with brightly colored peppers make Jerusalem Cherry a favorite ornamental indoor plant in fall and winter. White, star-shaped flowers cover this shrubby plant in summer. Beginning in fall, the flowers are followed by small, round fruits that turn from green to yellow to orange to red as they slowly ripen. They are long-lasting and will "decorate" the plant right through the winter. Although the peppers look a lot like cherry tomatoes, and may seem tempting, the peppers are poisonous and should not be eaten. Keep it away from children and pets who may be tempted by the colorful fruit. You'll find these ornamental pepper plants for sale just about any time of year. They're sometimes sold as Christmas Cherry or Christmas Pepper around the holidays. Let the sun shine in. Jerusalem Cherry makes an attractive patio plant, where it will get the direct sun it needs to grow, flower and produce peppers. Just be sure to bring your plant back inside before the temperature drops in autumn. This South American native is frost-tender. Give it a rest. After the fruit is no longer attractive, cut the stems back by half. Reduce watering, but don't allow the soil to dry out completely. Place the plant in a cooler spot (around 60°/16°C). 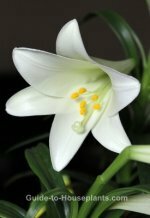 In late spring, move it back to a sunny window -- or outdoors after the last threat of frost has passed -- and resume normal care. Got a reluctant bloomer? Plants that don't bloom usually aren't getting enough light. The cool rest followed by a warm, sunny summer should trigger a flush of new flowers followed by peppers. Don't forget to fertilize during the growing season. Plants grown in pots need to be fed regularly. Got blooms, but no peppers? Plants kept for a second year may bloom, but not produce peppers because they aren't pollinated. Don't worry -- it's easy to do. How to pollinate your plant: Plants grown outdoors get pollinated from the wind or insects that carry the pollen from flower to flower. If you've kept your plant indoors, it needs some help from you. Use a small, clean paintbrush to dab the stamens in the center of the flowers, moving from flower to flower to spread the pollen around. Repot root-bound plants in spring. Move up to a pot 1 size bigger to give it a little space. Use a pot with a drainage hole to prevent overwatering, which can lead to root rot. Deal with pests. Something bugging your plant? 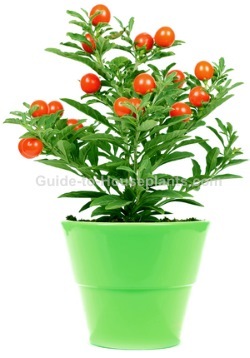 Jerusalem Cherry is sometimes infested by aphids, whiteflies or spider mites. Regular misting with tepid water will help to prevent an infestation of spider mites, which prefer hot, dry conditions. Use an insecticide, if needed. Organic neem oil insecticide is an effective treatment for many pests. Light: Put your plant in a bright location where it will get a few hours of direct sun each day.You can move it outdoors for the summer, if you want. Bring it in before the first frost and you'll enjoy its colorful display through the holiday season. Water: Keep the soil evenly moist. Reduce watering in spring, when the plant is resting. Humidity: Aim to maintain 40-50% relative humidity around the plant. Mist the plant every day in summer and stand the pot on a tray of wet pebbles. Keep the plant away from heat/air vents. Blasts of dry air will cause the peppers to shrivel and fall off early. Temperature: Average room temperatures 60-75°F/16-24°C. If you move your plant outdoors for the summer, don't worry -- it can take the heat. If won't, however, tolerate frost. In the fall and winter months, keeping it on the cool side will help the fruit to last longer. Fertilizer: Feed monthly spring through fall with a tomato fertilizer. Propagation: Stem cuttings or seeds. Take stem cuttings in spring and root them in moist potting mix. Gather seeds from ripe fruits and sow in early spring.